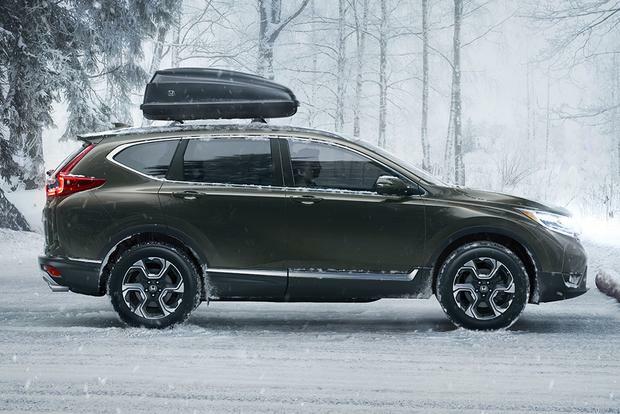 The 2019 Honda CR-V offers superior space, performance, fuel economy, comfort, interior quality and safety that make it a top SUV pick. 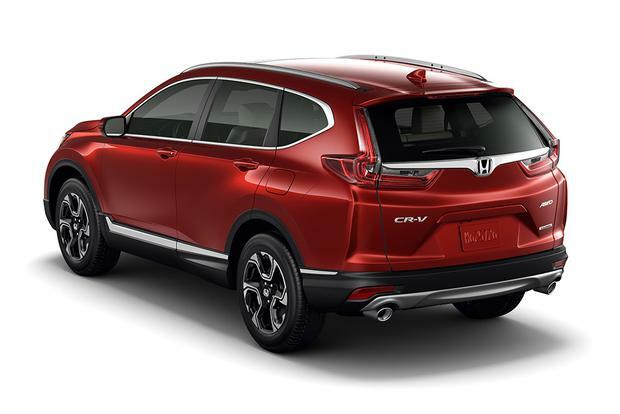 2019 Honda Pilot vs. 2019 Honda CR-V: What's the Difference? 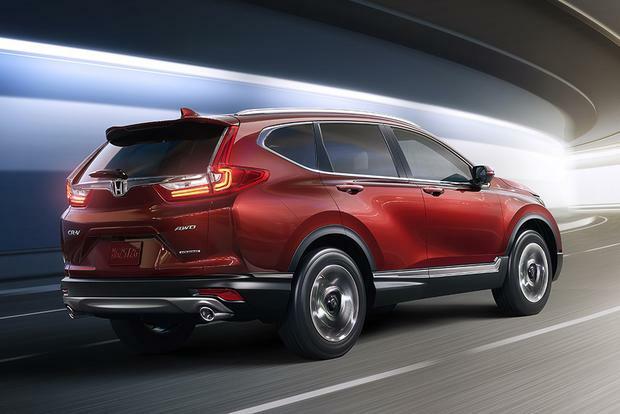 Both of these Honda crossovers are reliable and offer a great value, but which one is better for you? 2019 Acura RDX vs. 2019 Honda CR-V: What's the Difference? The new RDX is more different from its Honda cousin than ever before. Here are five crossovers that will help you reach your destination confidently despite Jack Frost's best efforts to slow you down. 2018 Honda CR-V vs. 2018 Mazda CX-5: Which Is Better? How does one replace the best-selling SUV in the United States? Radical transformations are often met with reversals of fortune, while tepid evolution can risk falling behind an ever-improving pack. The completely redesigned 2017 Honda CR-V represents that just-right sweet spot in between, enhancing things people already loved and improving upon those that needed to be better. The overall result is a more grown-up CR-V, literally and figuratively, that makes that pack of other so-called "compact" SUVs seem underwhelming by comparison. It may be a bit tough to tell the new CR-V apart from the old one on the outside, but you should be able to tell the difference immediately after climbing into the driver's seat. The design is more visually interesting, with more three-dimensional elements and greatly improved materials. There are soft-touch surfaces now in places where the old CR-V featured hard plastic. The top Touring trim level, with its matte woodlike trim, elevates this once uber-utilitarian SUV to near luxury status. Plus, the difference between its interior and that of the Toyota RAV4 is shockingly stark. 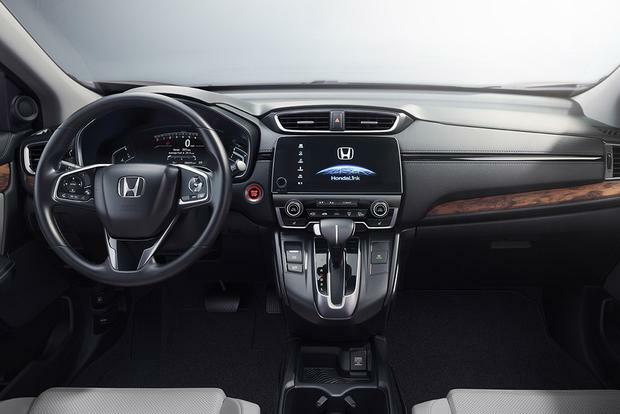 All but the base trim level come with a revised version of Honda's rightly maligned touchscreen interface. It now has a volume knob and shortcut buttons for the navigation, audio and phone systems, which greatly reduces the confusing back and forth between menus that characterizes the touchscreen found in the Civic and Pilot. 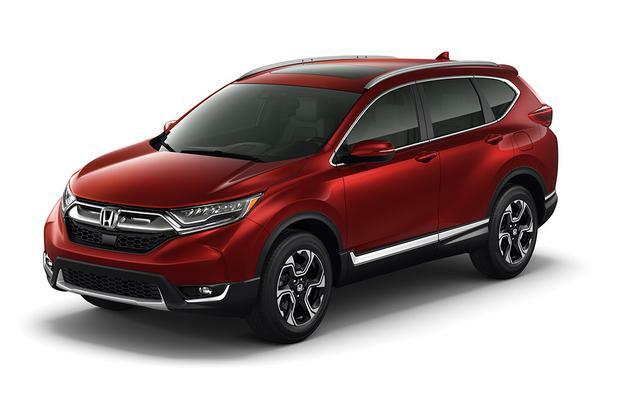 Unfortunately, the system remains on the slow side, but it isn't so much worse in comparison to rival systems to make you think twice about the CR-V.
Like the back seat, the old CR-V already had one of the biggest cargo areas in the segment. Actually, it bettered most 2-row midsize SUVs. With its slightly larger exterior dimensions, the 2017 Honda CR-V now has THE biggest cargo area. Its load floor is even flatter now, the back seat is still easily lowered by pulling levers and the lift-over height continues to be impressively low despite the CR-V also gaining a considerable amount of ground clearance. In total, owning a CR-V means you can carry more stuff and have an easier time loading it inside. Up front, smaller items can be stored in the ingeniously redesigned center console -- something that can be said of every recently introduced Honda. In this case, there is a smaller forward bin for various odds and ends, a pair of sizable cupholders and a deep multipurpose bin that features a sliding and movable L-shaped tray. It can keep a plugged-in smartphone out in the open or, when slid rearward, keep things under the armrest cover and away from prying eyes. Removing the tray completely provides the sort of space that owners of older CR-Vs used to devote to small purses. Now, inside that new center console (on all but the base LX) is a pair of USB ports -- one for charging only, and another that handles data streaming between the car and your phone, which includes Apple CarPlay and Android Auto. Another pair of charge-only USB ports reside on the back of the center console, which should be a hit with the power-hungry kids sitting in back. Other new features include standard alloy wheels (no more steelies on the base LX), while the EX trim and higher now include front-collision warning and automatic braking, a blind spot monitoring system (this essentially replaces the questionably useful LaneWatch camera on other Hondas), lane-keeping assist and Honda's latest adaptive cruise control. Compared to the older version in other Honda models, the new ACC does a substantially more natural job of slowing down when a car comes into range ahead and speeding back up again when it clears. Another appealing new feature is Automatic Brake Hold. When the dash-mounted button is pressed, the CR-V will automatically hold itself in place when stopped without any further brake input. This is a nice, trickle-down feature from luxury cars. 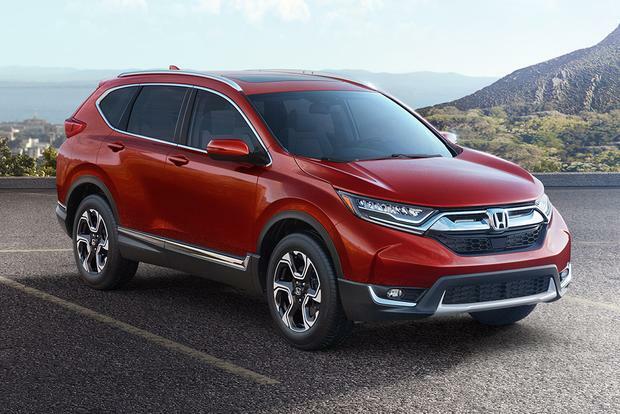 The previous CR-V's 2.4-liter 4-cylinder engine carries over for 2017, but only to the base LX trim level. Its 184 horsepower and 180 lb-ft of torque remain competitive in terms of power, acceleration and fuel economy. The latter, according to the Environmental Protection Agency, is 26 miles per gallon in the city, 32 mpg on the highway and 28 mpg in combined driving with front-wheel drive. All-wheel drive (AWD) decreases each figure by 1 mpg. Every other trim level, however, comes with a 1.5-liter turbocharged 4-cylinder that debuted to great fanfare in the Civic. Although, at 190 hp and 179 lb-ft, it gets a bit more power over Honda's compact sedan, the CR-V's greater weight means it doesn't impart the same sort of spirited acceleration. Indeed, its output isn't really that much different between the two engines, and it's hard to say that one is overtly better than the other. They're just different in terms of character, as the new engine is a little growlier and the continuously variable transmission tends to keep it at a lower rpm, where its broader midrange power delivery is located. So why the new engine? Well, it's more fuel efficient, at 28 mpg city/34 mpg hwy/30 mpg combined (FWD). Again, AWD sacrifices 1 mpg in each cycle. Honda gave us a chance to drive the 2016 and 2017 CR-Vs back to back, and it was easy to feel the difference between the two SUVs. The new CR-V just feels more grown up and sophisticated. It's quieter, its ride is more comfortable and controlled, and its steering needs fewer corrections when driving on the freeway. Actually, when cruise control is activated, the steering's assistance is even increased to counteract the effect of sloped pavement. That same steering doesn't feel quite as responsive when turning into a corner, however -- the 2016 actually feels a bit sharper and more agile as a result. Yet despite that initial feeling, the new CR-V ultimately possesses superior road holding thanks to upgraded suspension components. 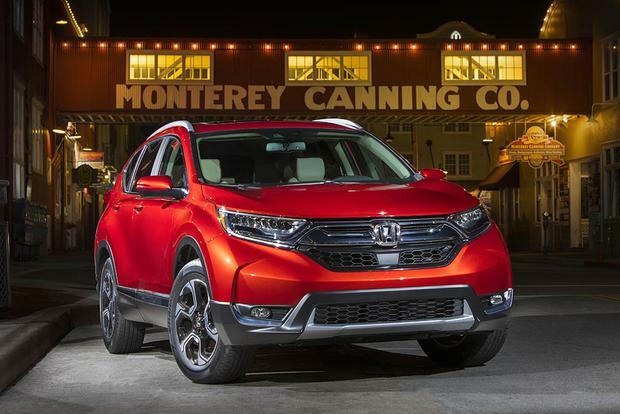 Besides the 2016 CR-V, though, the new model also feels more sophisticated compared to rivals like the Toyota RAV4 and Subaru Forester. It still doesn't possess the sportiness of a Mazda CX-5 or Ford Escape, but then we're guessing most CR-V buyers will happily trade that for greater utility.